FOXBOROUGH, Mass. -- New England Patriots offensive coordinator Josh McDaniels has backed out of the Indianapolis Colts' head-coaching job and will once again team up with quarterback Tom Brady, which sparks a few questions. 1. Is McDaniels the heir apparent for the Patriots' head-coaching job when Bill Belichick decides to retire? 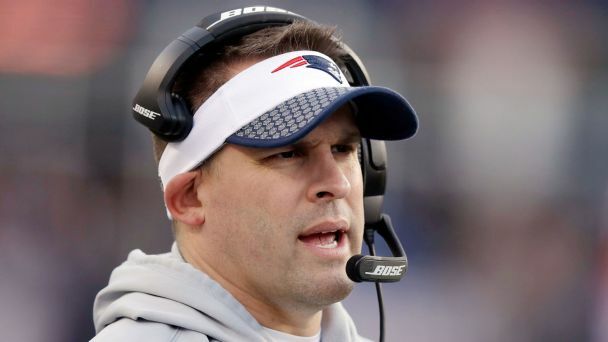 • Is McDaniels heir apparent to Belichick? Not necessarily, but it seems fair to say he will be given a prime opportunity to succeed Belichick if he so desires. Belichick turns 66 on April 16, and while he has committed to return to the team in 2018, he is obviously closer to the end of his career than the start (or even the middle). McDaniels values the stability he has had in New England for his family, and in meetings with owners Robert and Jonathan Kraft the past two days, he now has a clearer picture of how he is viewed even though he has been given no assurances for the future. Such clarity wasn't there for him in December when he was considering how aggressively to pursue head-coaching vacancies across the NFL. He also lacked certainty on Belichick's and Brady's plans at that time. But one future question for McDaniels to consider: Would he really want to replace Belichick whenever that time comes? That might be one of the toughest jobs in the NFL, although if McDaniels could team up with close pal and Patriots director of player personnel Nick Caserio, it might entice him to take the plunge if that opportunity presents itself. One thing he probably has learned through his previous head-coaching experience and other interviews is that there is no perfect situation. 2. Where does this leave McDaniels in terms of ever getting a head-coaching offer again? It will take some time for him to be a top candidate for other teams, but he's only 41, so it seems extreme to say he'll never get another offer over the next 20 years. Just as it took some time for him to distance himself from his stint as Broncos head coach (2009-10) that went sideways quickly, and ultimately become a top head-coaching candidate again seven years later, he'd be wise to back off in the next few years. The Patriots have Brady (who turns 41 on Aug. 3) entering the final stretch of his career, as he has said he hopes to play until his mid-40s. McDaniels will play an important role in grooming Brady's ultimate successor. If that goes as well as it did with Jimmy Garoppolo over the past four years, it will be hard for teams to keep bypassing McDaniels after 2020, based on his excellence as a quarterbacks coach and playcaller. 3. Where does this leave the Patriots' quarterback situation? In a better place than it would have been, because the Patriots didn't have a clear-cut, in-house replacement for McDaniels as offensive coordinator/quarterbacks coach. Brady is coming off a stellar Super Bowl LII in which he threw for 505 yards, and he'll be back atop the depth chart in 2018, with veteran Brian Hoyer the current top backup. The Patriots also will probably take a long look at drafting a quarterback in hopes of finding "the next Garoppolo" and they have a first-round pick (No. 31) and two second-rounders as currency to put them in position to maneuver around the draft board to do so. McDaniels' return also puts the focus back on his relationship with Brady, which drew attention during the 2017 regular season when Brady lashed out at him on the sideline. But Brady later apologized and said, "I love Josh." Their strong connection, and how they push each other, has also been highlighted in Brady's "Tom vs. Time" documentary.